For the band, see Manimal (band). Manimal is an American action–adventure series that ran from September 30 to December 17, 1983, on NBC. The show centers on the character Dr. Jonathan Chase (Simon MacCorkindale), a shape-shifting man who can turn himself into any animal he chooses. He uses this ability to help the police solve crimes. For every episode except the pilot, actor William Conrad recites the opening narration that tells of Chase's wealthy present life and his early days in Africa with his missionary father. Dr Jonathan Chase... wealthy, young, handsome. A man with the brightest of futures. A man with the darkest of pasts. From Africa's deepest recesses, to the rarefied peaks of Tibet, heir to his father's legacy and the world's darkest mysteries. Jonathan Chase, master of the secrets that divide man from animal, animal from man... Manimal! Manimal premiered as a 90-minute pilot that aired on September 30, 1983. The series featured the story of Dr. Jonathan Chase, a shape-shifter who could turn himself into any animal he chose, and used this ability to help fight crime. Only two people were aware of Jonathan's secret, his friend Ty Earl and Police Detective Brooke Mackenzie. Jonathan and Ty would assist Brooke with a case she was working on, with Jonathan transforming himself into an animal when it became useful. While Jonathan had the ability to change himself into any animal, he would transform into a hawk and a black panther in nearly every episode. In some episodes, he would transform into a third animal, such as a horse, dolphin, bear, or bull, with the transformation taking place offscreen, though once he was shown becoming a snake. The transformation sequences were designed and created by the Academy Award-winning SFX artist Stan Winston. Another aspect of the transformations that added to the show's camp factor involved Dr. Chase's clothing during a transformation: He was depicted generally wearing a three-piece suit and tie, and the viewer would see it rip off him as he shape-shifted into an animal, though once the transformation was complete there would be no sign of his discarded clothing. A bit later, he would transform back into human form with all of his clothing perfectly restored upon his person, even if he was unconscious. In one episode, he was shown to be able to assume the aspect of various animals simultaneously, rather than adopt their forms, such as the agility and speed of a panther or the suppleness and fast strikes of a snake. 1983-84 8 September 30, 1983 December 17, 1983 90 10.1 "The Yellow Rose"
90-minute pilot: When a group of thieves devise a plan to hijack a shipment of nerve gas, Detective Brooke Mackenzie must stop them. She teams up with Dr. Jonathan Chase, a man that knows the secrets that divide man and animal and who is trained in an African technique that allows him to transform into different animals. A Bulgarian ambassador hides behind his immunity status to smuggle illegal goods into the country. While being interrogated by Russian agents about the location of a list, a man dies from a truth serum drug. A note and $2 million are left to his daughter Terry. Jonathan, Brooke and Ty must protect Terry while trying to locate the list before the Russian agents do. After a girl is found living with wolves in the forests of Sultanpur, India, she is the topic of discussion at a local university where she is being held. When an attempt is made on her life, Jonathan takes her into his care and protection. Her identity must be found in order to discover who it is that is trying to kill her. This episode has an almost identical storyline to a 1986 episode of The Wizard titled "Endangered Species", as well as a 1994 episode of the same name in Thunder in Paradise. All three episodes were written by Michael Berk and Douglas Schwartz. When a horse trainer recognizes her stolen horse in a race, Jonathan helps her try to recover it. While at the beach, Jonathan and the others discover a scrimshaw (walrus tusk with carvings on it) in the clutches of a skeleton. They begin investigating at a local bar where they encounter someone who has been looking for it for their whole life. Jonathan, Brooke and Ty must stop a criminal who extorts money from businesses in China Town while posing as a superstitious icon known as The Dragon. In this episode, Walter Nebicher from Automan can be seen walking outside a Chinese restaurant. Both Manimal and Automan were filmed back-to-back with the same scene, at a different angle, appearing in an episode of Automan. While on a well-deserved vacation, Jonathan, Ty and Brooke get involved to thwart an attempt by a syndicate boss to illegally take over the town of Birch Hollow in order legalize gambling and build a large casino. Glen A. Larson, the creator, briefly resurrected the Jonathan Chase character for a crossover with his 1990s series NightMan. In that episode, Manimal's traditional, practical-effects transformation was abandoned in favor of a CGI sequence. Nightman allies with Dr. Jonathan Chase, a man who knows how to transform into different animals. On August 27, 2012, Manimal: The Complete Series was released on DVD in the UK in PAL region 2 by Fabulous Films. The three-disc set includes the TV-movie pilot and seven original full-length episodes. Special features includes a near 20-minute interview with series creator Glen A. Larson, production notes, biographies, galleries, Automan TV series trailer and episode guide booklet. On October 18, 2012, Manimal was released on DVD by Condor Entertainment (3 disc set) in France. On November 10, 2015, Shout! Factory released the complete series on DVD in Region 1 for the very first time. The 3-disc set features all 8 episodes of the series as well as bonus features. In 1984, a Manimal Annual was released in the UK- a book containing stories and comics and games based on the show. Manimal was scheduled opposite CBS's popular soap opera Dallas. The 90-minute pilot aired on September 30, and the one-hour series began airing two weeks later. Manimal was placed on hiatus after only four regular episodes had aired, and production on the show ceased at that time. The show returned to the NBC schedule a month later, burning off the three remaining produced episodes before the show was officially canceled due to low ratings. 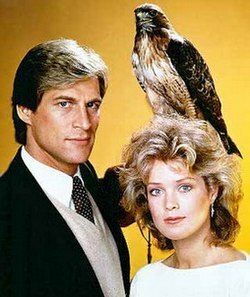 Manimal was a part of NBC's 1983 fall line-up which also featured eight other series that were canceled before their first seasons ended (including Jennifer Slept Here, Bay City Blues, and We Got It Made). Manimal is not well regarded by many TV reviewers. John Javna's book The Best of Science Fiction TV included Manimal in its list of the "Worst Science Fiction Shows of All Time", along with Space: 1999, Lost in Space, Buck Rogers in the 25th Century, and The Starlost. TV Guide also ranked Manimal number 15 on their list of the 50 Worst TV Shows of All Time in 2002. In 2004, readers of the British trade weekly Broadcast voted Manimal as one of the worst television shows ever exported by the U.S. to the U.K. It placed fifth on their list, exceeded only by Baywatch, The Anna Nicole Show, The Dukes of Hazzard and Wild Palms. The Ultimate Encyclopedia of Fantasy described Manimal thus: "Axed after seven regular episodes, the only surprise being that it ever got past the pilot stage". In September 2012, it was reported that Sony Pictures Animation is developing a live-action/CGI film based on Manimal. The series creator and producer, Glen A. Larson, was once again attached as a producer. In July 2014, Deadline Hollywood reported that the film will be produced by Will Ferrell and Adam McKay through their Gary Sanchez Productions, and by Jimmy Miller through his Mosaic Media Group. Jay Martel and Ian Roberts have been hired to write the script. ^ "1983-84 Ratings History -- The Networks Are Awash in a Bubble Bath of Soaps". ^ Hofstede, David (2004). What Were They Thinking: The 100 Dumbest Events in Television History. Back Stage Books. p. 87. ISBN 0-8230-8441-8. ^ John Javna, The Best of Science Fiction TV: the critics' choice. New York: Harmony Books, 1987. ISBN 0517566508 (p. 76–77). ^ Baywatch dubbed "worst TV import" BBC News, 25 November 2004. Retrieved 10 October 2017. ^ Kit, Borys (September 17, 2012). "'Manimal' TV Series Being Turned Into Movie at Sony Pictures Animation (Exclusive)". The Hollywood Reporter. Retrieved September 17, 2012. ^ a b Yamato, Jen (July 22, 2014). "'Manimal' To Roar With Will Ferrell, Adam McKay & Jimmy Miller". Deadline Hollywood. Retrieved July 22, 2014. This page was last edited on 23 March 2019, at 23:32 (UTC).